Together We Served is pleased to highlight the work of the Mariner/Marlin Association. 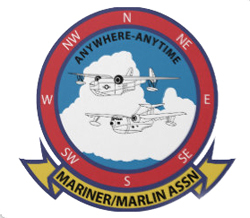 Since 1982 the Mariner/Marlin Association has been instrumental in preserving the history of Martin seaplanes by uniting those associated with the aircraft through annual reunions and publications. Membership is open for all to join regardless of affiliation or interest including flight crews, support units, and civilian personnel who flew, crewed or supported Martin seaplanes. The association is inviting it’s members to join Together We Served to preserve their history and tell their stories. With the declining numbers of Seaplane Sailors, it’s important that we reach as many of them as we can before they are all gone. If you would like to have your association featured in Dispatches, please contact us at admin@togetherweserved.com.